Chandeliers provide ambient overhead lighting that can fill a space and set a mood. No longer relegated to only dining rooms and entryways, chandeliers are popping up in living rooms, hallways, bedrooms and bathrooms. Not only do they provide much needed lighting, but can provide a unique opportunity to add style, flair and opulence to your space. Traditional – typically have candle shaped lamps with scrolling metal structure that may be further ornamented with additional details or crystals. 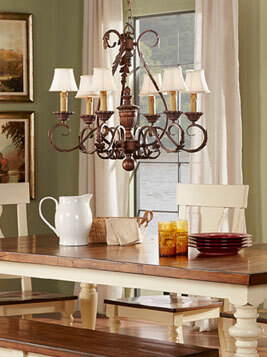 With or without shades, traditional chandeliers add an instant formality to your space. 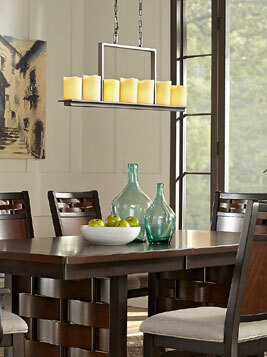 Tiered – any style of chandelier that has multiple layers or levels of lighting sources is considered tiered. One tier will work well for modest spaces or low ceilings, but tiered chandeliers are larger and will command a presence in large spaces like vaulted entryways. 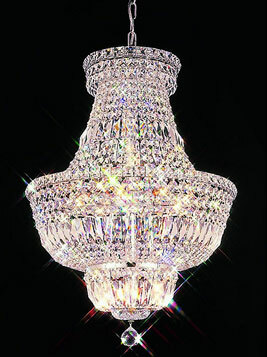 Crystal – the quintessential concept of what a chandelier can be. 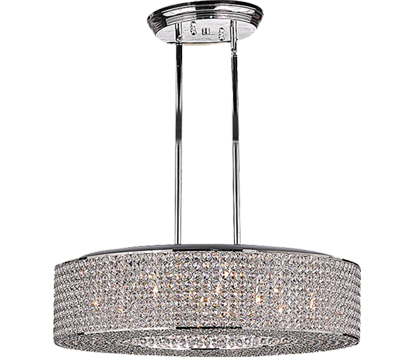 Exuding sparkle and glamour, these chandeliers create a mood of elegance. Even with the lights dimmed low, they shimmer like no other. These two drum chandeliers virtually the same shape, but completely different styles creating an entirely different effect in any room. 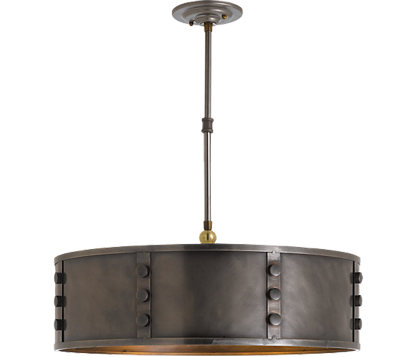 Drum – characterized by a drum shaped lampshade encircling the lighting. Can be one shade encircling the entire fixture, or individual drums surrounding each bulb within the fixture. Rustic – these fixtures have a more casual feel, and include elements like distressed or unfinished materials, animal horns, branches and the like. Modern – expressing clean lines and possibly even futuristic styling, modern chandeliers make a bold statement with their simplicity. 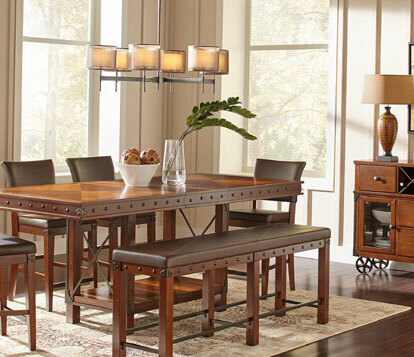 Transitional – these chandeliers walk the line between traditional and contemporary. Typically the will have the overall shape of a traditional piece translated into a more streamlined modern detailing. Mini – a new chandelier trend of down-sizing to fit smaller spaces, mini chandeliers are being added to alcoves, niches and nooks. 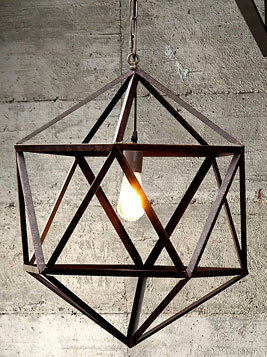 These are smaller versions of chandeliers, and can even be grouped similar to a pendant light. 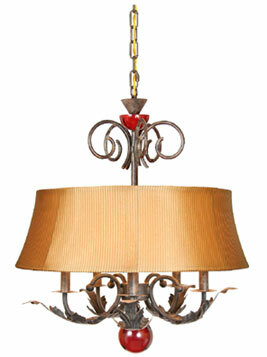 Different styles of chandeliers can transform a room and many styles can fit into a wide array of rooms. Mixing styles add interest to a space. 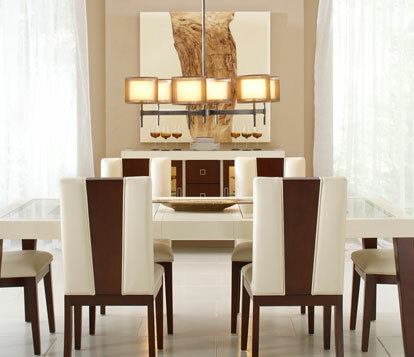 In the above photos, the same chandelier works great in two completely different dining rooms, one dining room with clean modern lines, the other with rustic finishes and industrial undertones. Entryways and dining rooms are the most common places to hang a chandelier, but don’t let that limit you, chandeliers are being used throughout the home to provide ambient lighting, make a statement or create a mood. 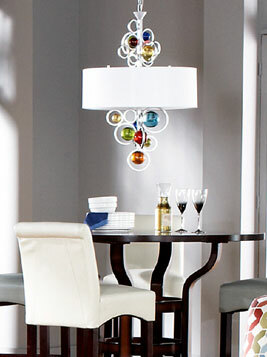 A unique chandelier can be a bold accent piece in a room that adds to the ambiance and style of a space. With the variety of styles and finishes available, bedrooms, bathrooms and living rooms have all become popular places to install these beautiful decor accessories, not to mention reading nooks, alcoves and kitchens.